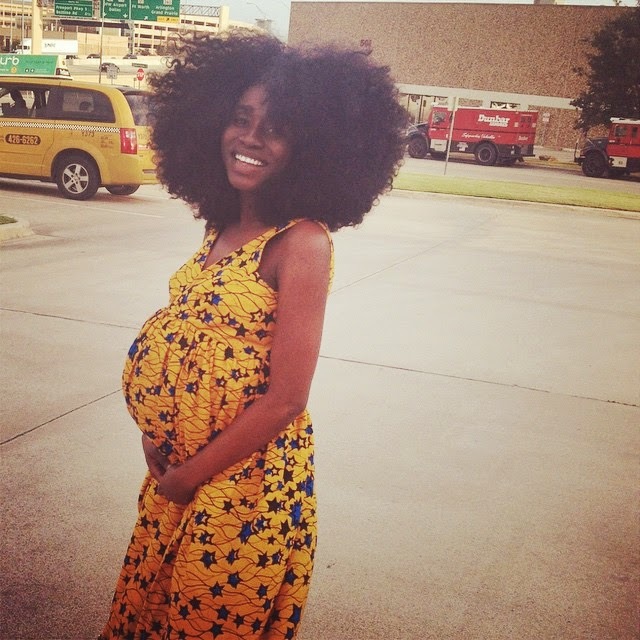 Celebrity photographer and singer, TY Bello welcomed a set of twin boys in October 2014 after waiting for 9 years. 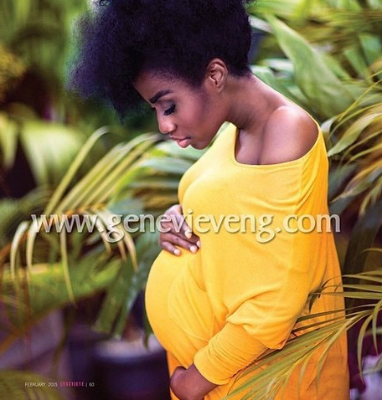 In the latest edition of Genevieve Magazine, which she covers with her twin boys, she has opened up on her struggles with Endometriosis, dealing with pressures from friends and family to get pregnant, the rumors that she didn't carry her pregnancy herself and the birth of her twin babies. "My journey to pregnancy was a very intense one. I had just been through the toughest nine years of trying to get pregnant, being confident that it would be a breeze since I had always known that I would make a great mother. It was quite humbling when it didn't happen as I had envisioned it. It was grueling actually." "At first we didn't know I was carrying twins. When I was going for my test, I didn't feel pregnant. Before I went, I heard in my spirit, 'Wear something nice'. I questioned the voice and wondered if it was nice to dress so nicely and get disappointed, setting myself for a heartbreak. In the end, I obeyed. I decided in my mind that whether I was pregnant or not, I was not going to stop believing. My doctor was very dramatic about the announcement too. She screamed so much we couldn't even decipher her words. I had a delayed reaction as her words wouldn't sink in. It was overwhelming, We were truly happy and couldn't stop crying. I remember two people, Pastors Obi Pax Harry and Angela Ashong telling me matter-of-factly that I was going to have twins. It happened to the detail. My friends know how I have always made it a joke about having twin boys to make up for lost time. I wanted boys because I joked that I was an eternal fourteen year old lanky boy myself and so we would all get along. I can't believe God was listening. It was few months before we could confirm that we were having boys"
"In perfect timing though, two older friends of mine, Dr Odaga and Mrs Morin Desalu came into our lives and helped us be more proactive in our journey to becoming parents. What started with dark clouds took a turn. For instance when Aunty Morin whisked my husband and I to see her doctor at George's hospital. We discovered that a long standing yet undiagnosed battle with Endometriosis was responsible and I just assumed I had the worst period pains. Shortly after that, through Dupe Kupoluyi, we met a fantastic doctor named Yemisi Bero at the Arc Clinic who became our fertility doctor. I went through my IVF cycle with her, probably in the middle of the busiest seasons in my career. I remember jabbing myself at airports sometimes just to keep with the schedule as I worked like crazy. Sometimes I think I stayed so ridiculously busy just to keep my mind off the difficult process. To the glory of God, that cycle was successful and everything inside of me screamed for me to slow downed but I didn't just know how. I decided to start a pregnancy journal and instinctively titled it "Quiet Streams" Immediately I knew then that everything was going to change and it did. It was like a switch was flipped and my body went rest mood"
"Oh you can't even begin to imagine. Society and even your personal fears can pressure you before a desire manifests. In our society, as with most, once you hit a four year mark after your wedding, everyone around you starts to blare their alarm. Nine years? Now that was deafening. Every time I prayed, I knew everything was going to be fine and my life was in the course set for me. The pressure gets more difficult when you are trying and it isn't happening. It was important I turn a deaf ear sometimes. It was important that I didn't feed my doubts. Someone once said to me after the babies came, "You can't call your experience waiting, you were living your life to the full before their arrival". I explained that that was exactly my waiting experience. I always say that Christ came to die that we may have life and have life abundantly and that I want to live life to the maximum. If you allow yourself to sustain a state of misery because you don't have something, whether marriage, children or a dream career, then you can't have a full life. It is in the place of living outside of the tyranny of the desire that it comes to you in its full glory. I knew for sure I was born to be a great mum. I just wasn't sure on how it would play out but I knew it would happen nonetheless"
"There were some tough days especially towards the end when I battled with thoughts that God had given me everything else I asked him for and that maybe this was the one thing I would have to let go of. I however knew deep down that this was untrue. I concluded that our desire for parenthood was persistent only because it was a prayer answered. Faith opened me up to the reality that God would answer me and I didn't need to hand-twist him as to how. This was what helped open my heart to an IVF process in the first place "
"We put every option on the table. It helped that we had so many friends who had gone through the different paths to parenthood. Ironically while trying, I had photographed a family that had tried for over a decade and had just welcomed a bay via a surrogate mother. I have done countless baby shoots before and I saw no difference between theirs and others. It was really comforting when I observed the bond was exactly the same across board. I also have friends that adopted children and they are not in anyway less happy. Motherhood is truly spiritual. I think considering other options isn't giving up but letting go. It's in this place that Miracles happen". "Endometriosis can make conception more tricky and difficult but I and countless other women stand as testament that it doesn't make it impossible. But at the end of the day, people react differently so its difficult to generalize. For me once my pregnancy progressed, it seized to be a major concern"
"Funny enough I had a shoot during my pregnancy and the makeup artist who did my makeup during my maternity shoot was in a room where this was being thrown around and she couldn't stop laughing as she spent enough time with me when I was pregnant. I was blessed to have Kelechi Amadi-Obi make the photographs and it was special as he had photographed our wedding as well. Its beautiful to have your bump photographed in appreciation but not necessarily as evidence of your being with a child. There are women who would become mothers via adoption or surrogacy. The difference is insignificant. We all carry our children"
"Waiting of any kind can be very troubling. You can't imagine what a waiting woman goes through. I have sooken to may women and they described the process as getting an endless cycle of hope and disappointment. That is what breaks the spirit coupled with the stigma, especially in this part of the world. My advice is to never let go of the desire to be parents as God himself put it there. Celebrate the fact that you are alive and never take it for granted. Give yourself permission to experience joy, to dream and fulfill purpose as you wait. It adds value to the type of parent you become. It is always worth it in the end"
"It is in the place of living outside of the tyranny of the desire that it comes to you in its full glory..."This words are so very true... this was truly inspiring, thank you for posting!! !